Two controversial stories featuring Sarah Palin were published in Jewish news sources last week. One was in coverage by JTA, a Jewish news service, of Palin's anointing ceremony in which Thomas Muthee, before "imparting" the anointing, made statements implying control of the financial world by "Israelites." [Link here.] The other was an article by Caroline Glick in the Jerusalem Post in which she accused American Jews of risking Israeli lives by disinviting Sarah Palin to speak in the recent rally protesting Iranian President Ahmadinejad at the United Nations. The article was titled "Our World - your abortions or your lives." ...the Jewish people today are in slavery to many false gods in America.... My prayer is that American Jewish people become aware of the bondages to these gods and break free from them.. They must make Aliyah (return) to Israel before greater judgment or plagues come upon America. The Jewish people in America must be freed from this slavery to materialism in all of its forms in order to escape to Israel. Because of the way the Jewish people have prospered and been blessed in America, this struggle is even greater than it was to leave Europe more than seventy years ago. There is so much blood on American soil, it is a miracle we have not already been destroyed as a nation! Many secular, reformed and conservative Jews have encouraged abortion despite the fact that the killing of their future generations will affect the future of the Jewish people. There is little difference today between child sacrifice in the Old Testament and abortions today. 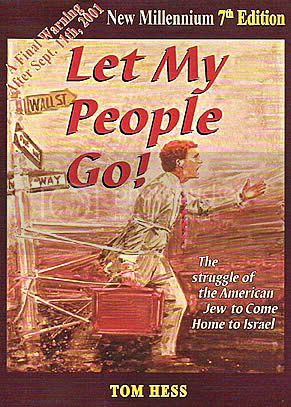 Hess goes on to warn his "Jewish friends" of what will happen to them if they do not leave their attachments to the sins of the United States. He uses the now infamous fishers and hunters example, claiming that Christian Zionists are the fishers trying to encourage Jews to leave the United States and other countries around the world before the hunters come after them. There are echoes of John Hagee's "Hitler as God's hunter" sermon, also exposed in a video by Bruce Wilson. People ask: Why did God allow the Holocaust in Europe? For years, a loving God warned the Jews to leave through Jewish Zionist prophets, but ninety percent of them refused to leave before it was too late! If more than ten percent of the Jews leave America before it falls or becomes a lesser power, it would be one of the first times in history. Zechariah 12:8 said that two thirds of the Jews in the world would be killed. One third of them, six million have already been killed in the Holocaust. I am concerned that six million more could be devastated in America unless they return soon. God says in Jeremiah 16:16 that he will send for many fishers to warn and help them return to Israel. In Europe, the fishers were the Zionist and the hunters were the Nazis. Today in America the fishers are the Jewish prophets as well as the Christian Zionists. May the Jewish people respond to the fishers today or the hunters may soon come. In America they could be the KKK, Islamic terrorists or others. This book is written with a deep love to warn the Jewish people to escape the Daughter of Babylon (USA) because it is about to be greatly devastated. Precious Jewish people, if you don't leave immediately, you may go back with no money, you may be killed or may not be able to go back at all. The book was first published in 1987 with six additional editions published in several languages. The warning of the coming wave of anti-Semitism if Jews do not flee their respective countries, is a common theme throughout much of apocalyptic Christian Zionism increasing in the last several decades. Incidents of anti-Semitism around the globe are excitedly reported and viewed as fulfillment of their prophecy and as authentication of the accuracy of their prophetic narrative. It was for this reason that those who held these particular end time beliefs in the 1930s and 1940s remained silent when Hitler's persecution of Jews became known. They viewed it as part of the prophetic plan and some even went so far as to participate in the publishing of the Protocols of the Elders of Zion because it appeared to closely parallel their own end time narrative and their personal view of Jews. For these apocalyptic Christian Zionists, "good Jews" are those who act in accordance to the role assigned to them in this end time drama while "bad Jews" or those that stay in their respective countries for reasons of greed, materialism, and other evils. Likewise, they view Jewish leaders who work in conjunction with Christian Zionists as doing God's will, while those Jewish leaders who resist their assigned roles in this apocalyptic drama are supposedly avoiding God's will due to their attachment to evil, usually described as being of a liberal or secular nature. Those Jewish leaders who veer from the Christian Zionist narrative become vilified as obstacles to God's will, regardless of their previous partnership. One day when I was praying, I saw a vision of a train leaving the station. The locomotive was the Lord leading the exodus form the "land of the north" (Jeremiah 16:15). The attached cars represented the Jewish people from all the other cities and nations, immediately following the locomotive. It is time for the Jewish people to get on the train coming out of Russia and the Ukraine, but also for them to get on the cars from New York, Los Angeles, Miami, Chicago, Boston, Baltimore, Philadelphia, Washington, DC, San Francisco, Cleveland, Paris, Beunos Aires, London Capetown, Toronto, Montreal, Budapest, Sydney. Train , cars, and planes are bringing His people home to Israel! Like John Hagee, Hess and other Christian Zionists have included anti-Semitic memes in their sermons and writings that encourage the view of Jews as the manipulators of the financial system. Very frankly, if I were a Jewish person, I would take Tom Hess message very seriously. Having a love for Israel and the Jewish people, it would give me deep pain for some of my Jewish friends to leave these shores and make aliyah to Zion. I think, however, that the pain of staying could conceivably be worse. I do recall that the Jews of Germany were saying that it couldn't happen right up until the time of the unleashing of the Holocaust. After 911, the USA will never be the same. Also, if we should see a financial collapse in America, there will be a search for a scapegoat. The history of western civilization demonstrates that the scapegoat usually, if not always, turns out to be the Jew. The second area whereby God wants us, wants to penetrate in our society is in the economic area. The Bible says that the wealth of the wicked is stored up for the righteous. It's high time that we have top Christian businessmen, businesswomen, bankers, you know, who are men and women of integrity running the economics of our nations. That's what we are waiting for. That's part and parcel of transformation. If you look at the -- you know -- if you look at the Israelites, that's how they work. And that's how they are, even today. So, what is the intersection of the above two stories? Both Tom Hess and Thomas Muthee are major figures in the New Apostolic Reformation, the movement featured in the series of articles on Palin's Churches and the Third Wave. Several previous articles in this series featured Muthees' role in the Transformations videos that have been used to advertise the ideas of possessing cities for "true" Evangelical Christianity through spiritual warfare. Muthee's story of saving Kiambu, Kenya for Christianity by expelling a witch is a one of four stories on the first Transformations video. See link here. Muthee has held major leadership positions in the network of the New Apostolic Reformation including the board of the World Prayer Center International. Tom Hess is one of several Apostles residing and working in Israel who are part of C. Peter Wagner's International Coalition of Apostles. These 500 Apostles from 42 countries around the world are at the top layer of the international network. Hess, along with other Apostles in the International Coalition of Apostles, are well known for their promotion and assistance to the Messianic Jewish branch of the Christian Zionism through support for the Messianic movement in Israel and in the United States. Other Apostles in ICA include Melva Beacham of Christian Friends of Israel, and Daniel Juster of Tikkun International in Israel. Charisma Magazine, which celebrates Messianic Jewish growth and evangelization in Israel is published by Stephen Strang of Strang Publishing, and Strang is also a member of Wagner's International Coalition of Apostles, as is Charisma editor, Lee Grady. Strang also serves as a director of Region Six of John Hagee's CUFI or Christians United for Israel. The above quotes from Let My People Go were taken from the 2004 edition. A 2003 edition was published by Morningstar Publishing. (Notice the glowing endorsements by Rabbi Joshua O. Haberman and Zalman Shoval, former member of the Knesset at the previous link.) Morningstar Ministries, founded by Rick Joyner, has close ties with Wasilla Assembly of God and its Master's Commission program documented in previous articles and videos. Link here to master document with links to the series of articles and videos. The book is marketed at Morningstar and Rick Joyner has contributed to another book authored by Hess titled "Restoration of the Tabernacle of David." The latter book also features entries by Mike Bickle, formerly of Kansas City Prophets and now IHOP or International House of Prayer and the IHOP Israel Mandate. See information on the Israel Mandate here. Others with entries in Hess' book include Rabbi Boris Grisenko of the Jewish Messianic Congregation in Kiev; Avner Boskey of Final Frontier Missions in Israel; and Ana Mendez, previously featured in other articles in this series. (Mendez was part of a group of inner circle Prophets and Apostles who traveled to the Himalayas for an intensive spiritual warfare battle against the Queen of Heaven. Mendez later stated that she believed their efforts may have helped to kill both Princess Diana and Mother Theresa, both whom they believed were influenced by the demon they were fighting.) See link to her testimony here. As documented in previous articles in this series, The New Apostolic Reformation is not waiting around idly for the Rapture, the rebuilding of the Third Temple, the coming of the antichrist, or any of the things that we normally associate with the Christian Zionist narrative. The New Apostolics have altered the theology to enable them to be the spiritual warriors who take the United States and the world, including Israel, for the Kingdom, in the here and now, in this generation. They are the "sword of the Lord," or "Joel's Army" and they believe they have the mandate to wage the war on evil before the Rapture so that Jesus returns to claim a purified and triumphant church. The urgency of the imminent return of Jesus is still there and frequently the Rapture is left in the narrative, but this belief is melded with the conviction that they have the mandate to begin the ultimate battle with evil now, in the present, and in the earthly realm. Link to previous article "Lions in the Pews." This continuing shift in theology also means a shift in Christian Zionism, as well as a change in their assigned role for Jews in this particular permutation of the end time narrative. What does this mean for the future of the relationship of Christian Zionist and those Jewish and Israeli leaders who have partnered with them? What are the expectations now for all the Jews that Christian Zionists have tried to frighten into making aliyah? If there is no need for "unconverted ethnic Jews" in Israel for the end time drama in this narrative, what does it mean for Jews who refuse to convert? What does it mean when major Apostles and Prophets of the New Apostolic Reformation are organizing prayers for Jerusalem in cities around the globe, including Pentecostal megachurches in Germany? If they believe they have a mandate to build their Apostolic kingdom on earth now, through a partnership of Apostolic Christians and Messianic Jews, what exactly are they attempting to accomplish when millions of people worldwide gather to pray for the peace of Jerusalem? These questions will be addressed in Part Two. Links to the previous articles in the series Palin's Churches and the Third Wave. Below are quotes relating to the Jewish Messianic Restoration of Israel and the coming Kingdom of the New Apostolic Reformation. The International Day of Prayer for the Peace of Jerusalem will take place this year on October 1, 2006 at 9:00AM at Migdal David, inside Jerusalem's Jaffa Gate and is hosted by Reverend Robert Stearns' Eagles' Wings and Dr. Jack Hayford's King's College and Seminary. Since the KCAC's inception in 2004, our caucus has pledged its support to this annual international initiative. Through this event, tens of thousands of Christians throughout the world pray and demonstrate their desire for the strength and well-being of Israel annually each October. Robert Stearns and Jack Hayford co-chair the Day of Prayer for the Peace of Jerusalem beginning in 2002. They now claim participation of 200,000 churches in 175 nations. "Dear Fellow Talmid-Yeshua, Disciple of The King! The King's Seminary has recognized what Chancellor Jack Hayford, Rabbi Jonathan Bernis, Dr. Ray Gannon, Dr. Dan Juster and Dr. Wayne Wilks have all understood for many years, e.g., the Messianic Jewish Movement's critical need for a fully-accredited, inexpensive, and universally accessible educational opportunity for Messianic Rabbis, Jewish laymen, and Anointed Spirit-filled team players in the Redemption of All Israel. The door of opportunity for Messianic Jewish ministry training at bachelors, masters, and even doctoral levels has now swung wide-open for Jewish believers and Spirit-filled disciples of all backgrounds who are feeling a strong urgency from heaven to successfully reach All Israel for Yeshua in our own generation. In addition to regular classes on The King's Seminary campus as desired, students are privileged to take Messianic Jewish Studies courses either ONLINE or through 3-day modules. You will find the six-week online courses stunningly informative and useful. The often two back-to-back 3-day modular courses are frequently preferred for face-to-face intensive sessions with some the best teachers in the Messianic Jewish movement." The King's Jewish Voice providing a seminary for Messianic Rabbis to be trained in the "Anointed Spirit-filled" Christianity of the Apostolic movement and to evangelize other Jews. The Kings Jewish Voice is part of Jack Hayford's Kings Seminary. The theme of the convocation was "Thy Kingdom Come." Tom Hess, as part of the first evening, felt that when Israel was reborn in 1948, there was also a paradigm shift toward the King retuning and The Kingdom being restored to Israel...After the Six Day War in 1967 the Jews began coming to their Messiah and there are now more than 300,000 Messianic Jews. While the majority of these are in the USA, the numbers in Israel have doubled in the last five years and continue to grow steadily...Following 11 days of teaching, prayer, and all of the above, 17 buses left for prayer journeys to various parts of Israel. Every bus met with local Messianic believers to support and encourage them. Tom Hess is the founder of JHOP, Jerusalem House of Prayer for all Nations. He also founded the All Nations Convocation Jerusalem and the Worldwide Watch Jerusalem 24/7 Link here and here. JHOP has a relationship with IHOP (International House of Prayer) and their Israel Mandate. The International House of Prayer is committed to seeing the nation of Israel walking in their full destiny at the end of the age. Our primary role is to pray for and partner with Messianic Jews who are living in Israel. The operation and visitation of the spirit in Israel is a vital part of releasing the great end-time harvest among the nations (Ezekiel 36:23-36). However, this full release will only come as a result of a body of believers who are committed to a life of night and day prayer living a fasted lifestyle. Prophet/Pastor/Author Rob DeLuca of Auckland, New Zealand delivered this word on God TV the evening of June 8, 2008, which was at Sunrise in Israel. He then called upon those in the audience of Jewish descent to come to the stage to be anointed and commissioned to fulfill their destiny, and stand in the gap for impartation to go to Israel. This is a transcription of his message to Israel. And then I heard the Holy Spirit say, "Son of Benjamin". And then I heard the name, "Benjamin Netanyahu". This is a word for Benjamin Netanyahu. "Salvation has come to you. You heard the words of salvation concerning the Lamb of God, concerning Jesus the Messiah. And the Lord has been touching your heart and He's going to use you mightily to protect your people. As God's people, Israel, begin to receive the saving grace of Jesus [Yeshua] the Christ [Messiah], there will be a great revival that takes place in Israel. Revival fire is coming to Israel." "The Holy Spirit is moving through the streets and the cities and towns of Israel. Arenas shall be filled and God's healing power shall move mightily among the Children of Israel." Jesus loves you, Israel. Jesus loves you Israel. Every Jewish person, every son of the 12 tribes of Israel, we bless you in the Name of the Father, the Son, and the Holy Ghost. Let's begin to bless Israel. Let's begin to bless God's people. "And God will fight on your behalf. And God will protect your nation." The American Jews, the German Jews, every Jewish person concerning the decent (sic) of your bloodline, concerning the descent of your name and your linage(sic), if you're watching right now, lift up your hands, right their(sic) in the room where you are watching on God TV. We release the fire of the Holy Ghost! On every American Jew! On every European Jew! On every African Jew! On every Russian Jew! Hundreds of Rabbis and Rabbinical Students have received a revelation of Yeshua Messiah over these past 40 years and perhaps the numbers will reach into the thousands now on this Yom Kipper October 9th. The walls of Mea Shearim are coming down as they did for Joshua's Jericho generation, in Jerusalem and Tel Aviv, and also in every city, town, and village of Israel. Jerusalem Rabbi Asher Intracter received an Apostolic Mantle Anointing through Chuck Pierce at the Beginning of the Year Glory of God Conference to move into the Fire of the Holy Spirit signs, wonders, and miracles. Could this manifest at Pentecost June 9th, 2008, only time will tell. But I believe this appears to be "such a time as this." I met Asher and Rabbi Daniel Juster at the 1990 Atlanta World Congress on the Kingdom of God where Daniel was a major speaker representing the Messianic Movement. Chuck Pierce referred to in one of the above quotes is the heir to C. Peter Wagner’s Global Harvest Ministries. C. Peter Wagner is the Convening Apostle of the International Coalition of Apostles. …I was greatly honored to be invited to attend King's College's leadership conference but circumstances were such that it was going to be difficult for me to leave Israel; still, I had a strong sense that I was to be part of this conference and so I went. I really did not know what to expect when I came to California, but I was amazed at the opportunity to be able to bring two messages to Jack's leadership gathering. To my surprise, I found out that Jack had dedicated his whole conference to the subject of Israel and the Messianic Jewish restoration. I have personally been in the Messianic Jewish ministry for almost 35 years and never, to my knowledge, has a denominational leader given his whole leadership conference to the subject of Israel and Messianic Jews. Revive Israel Ministries is led by Asher and Betty Intrater. Revive Israel Ministries is affiliated with Tikkun International. The Tikkun International Board consisting of Dan Juster, Don Finto, Eitan Shishkoff and David Rudolph functions as an apostolic oversight and accountability board for Asher and Betty. In Israel, Asher and Betty work in partnership with Ari and Shira Sorkoram and Eddie and Jackie Santoro. The primary goal of Revive Israel Ministries (as suggested by its name) is to help foster revival in the land of Israel. Our ministry is focused on the basic methods of 1) personal evangelism 2) discipleship training, and 3) congregational planting. Our area of operation is centered in Jerusalem and Tel Aviv. We believe in the simple and direct preaching of the gospel of Yeshua (Jesus) in the anointing of the Holy Spirit. Revive Israel at Gratefullygrafted.org(See tips for witnessing at the bottom of the site.) The Intrater have “apostolic covering” or oversight from Dan Juster, one of C. Peter Wagner’s Apostles in the International Coalition of Apostles. The Jew is the embodiment of the humanistic spirit. They are a barometer of Humanity - embattled within and without. As Paul said, “From the standpoint of the gospel they are enemies for you sake…” (Rom. 11:28). They were hardened, or made hard to reach, for the sake of the gospel. This is, the Jew represents the "acid test" of our message. Until we have a gospel that will make the Jew jealous, we do no really have it right.This means not only having it right doctrinally, but practically in the way that it changes us and that we reflect it in our preaching of the gospel. Perhaps this is why we are exhorted to preach the gospel to the Jew first, because when we preach to the Jew, we will quickly find out the quality of our message. Paul asserts that the hearts of Jews were hardened so that they would not accept the gospel until it was time for them to be grafted back into the tree which God had planted He also declares that if the cutting off of the Jews for a time resulted in blessings for the Gentiles, the greatest blessing of all will be their being grafted back in, which is, “life from the dead.” This nothing less than victory over the last enemy. In Romans 11:28 Paul makes the remarkable statement, “…concerning the gospel, they (the Jews) are enemies for your sake…(NKJV). The Jews have historically represented the greatest test for the gospel, but it is for our sake. In a sense, Jews are the “acid test” of our message. Until the church comes to the spiritual stature where she provokes the Jew to jealousy, we have not yet attained to what we have been called. Rick Joyner is head of Morningstar Ministries. Morningstar was the publishing house for Tom Hess’ 2003 edition of Let My People Go. Wasilla Assembly of God, the Master’s Commission program, and Ed Kalnins, have a close relationship with the leadership of Morningstar. 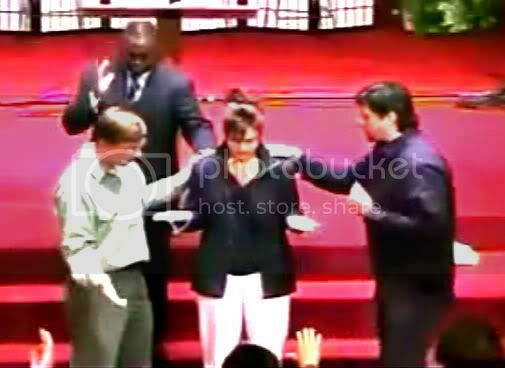 In May 2008 Kalnins brought back an anointing from Rick Joyner to his Wasilla church and delivered this anointing during the service on May 25, 2008. He later anointed Sarah Palins on June 8th at the One Lord Sunday Service. While I have been in wonderment over the last several years as to how we have seen the light and changed the error of our ways and are now completely anti-anti-Semitic, like we turned off a light switch or something, I have at the same time understood that it is only an illusion. The truth is we have become the best of buds with some Jewish people because we perceive it as being in our interest and in the interim we have found another group of Semites to vent our hatred on, Muslims. (Semite refers more to language than a group of people and since the majority of Muslims speak a Semitic language they are now the Semite de jour to hate) Not to mention the Muslims political utility of being a scapegoat for a common enemy whose threat requires that we give up all of our rights without question. Having grown up in a fundamentalist church, (however I am no longer having to attend therapy to deal with that part of my life and it only took 20 years to accomplish!) I grew up with the understanding that Jews we just evil, period. Although it was not clearly stated, at least not to my satisfaction as to why they were evil, besides of course not believing in the savior, it was just a de-facto truth, they were evil. And as a child if you want to get ostracized quickly in the fundamentalist church of the time period just ask the question, "Wasn't Jesus a Jew"? From that point forward my being a cute boy in the church went straight downhill never to recover. I have over the last couple of years started asking some of my Jewish friends about these organizations in Israel who are jumping in bed with these Christian Zionist groups and inquiring, do they just not know how dangerous these people are? I have tried to explain to them that if you think these people are your friends you are seriously mistaken and at some point are in for a very rude awaking. Just let Israel one day decide that fighting with their neighbors in the Middle East is just not getting them where they want to go and then decide that they are going to stop killing each other and find a way to get along and you will find anti-semitism will return at warp speed and with a vengeance. However, I finally had to conclude that they, like many liberals around the country I have talked with over the last several decades, really just do not understand how depraved Christian fundamentals are and just how really dangerous that makes them, especially now that they have some political power and clout. It is just not part of their experience and they tend to think they are just eccentric religious fanatics but their rhetoric of claiming the world for Christ is just ideology. Having been raised that it was my obligation as a Christian that, post secondary schooling, to focus all of my available time, talent and energies to obtain that goal I can attest that it is not just empty rhetoric. While it may be a news flash to some, their having obtained some political control of government today is what was being advocated as a requirement of being a real Christian in the 60's and we were obligated to accomplish at all cost, that is if we wanted to be right with Christ on judgement day. So no, it is not just ideology, it is a plan of action which from my perspective they have been frighteningly successful at. Let there be no mistake, these people really do want to take over the world and make it a Christian theocracy and have no qualms as to methodology utilized to reach said stated goal. As an atheist, I have had to come to grips with the fact that Christians and Religious Right fundamentalists are two very different birds. I must periodically inject into the conversations at atheist sites, that people like those here at T2A are our allies; We atheists would be in a world of hurt were it not for Christians fighting for freedom from religion. They are surprised to learn the MRFF's documented instances of military religious indoctrination complaints are made overwhelmingly by Christian soldiers. The same can be said for Jews who seem to think that Christian Zionists are looking out for their well-being. They do a grave injustice to Israel by allowing the Christian Zionists to promote propaganda unmolested. Could Hagee, Hess and their ilk be any more UnChrist-like? Thank you sincerely for all the hard work, Ruth. Thank you for your enlightening posts. I have been reading up on Palin and her quite frightening associations and activities and enjoy reading your articles. However, other than this site, I have been unable to find a definite link between Pastor Muthee and the New Apostolic Reformation. The Transformations video does not clearly state the fact. Would you be willing to share your source? I don't doubt your claim, I'm just curious as to where this connection comes from. Thank you, and keep up the good work. Central to the description of Kenya's Spiritual Mapping is the Prayer Cave Church in Kiambu, a suburb of Nairobi, under Thomas Muthee, who was hailed by the movement as `one of the best examples of power prayer'. After having been introduced to Wagner by Otis, he became a personal friend of the Wagners, East Africa Director of SWN, and one of the 13 board members of the World Prayer Center International Board. From " Spiritual Mapping: The Turbulent Career of a Contested American Missionary Paradigm, 1989-2005 " by R. Holvast. Will the Air Force Do Anything To Rein In Its Dynamic Duo of Gay-Bashing, Misogynistic Bloggers? Is Bannon Fifth-Columning the Pope? Respect for Others? or Political Correctness? "America - love it or LEAVE!" Extremely obnoxious protesters at WitchsFest NYC: connected to NAR? History of attitudes towards poverty and the churches. All trademarks and copyrights on this page are owned by their respective companies. Comments, posts, stories, and all other content are owned by the authors. Everything else © 2005 Talk to Action, LLC.